Thank you dear Srna, hugs. I like how everybody posed, the horse also ... splendid treasure my dear Harry you are sharing with us!!!! Congratulations on your SC Award. Thank you for your reply dear Jill. You may be right but I did not manage to find a known ancestor on the image. Thank you dear Nigel, most kind of you. An awesome vintage picture Harry. Was looking at the little girls clothing for a clue to what year the picture was taken but no can do. Lovely image Harry, probably of someone special to your ancestors. 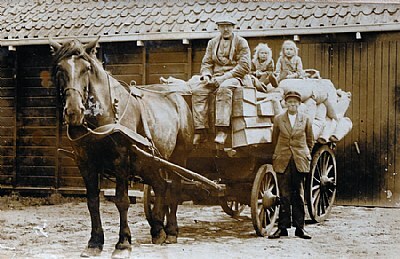 An excellent capture of by gone times,well for some.Here we still see this scene and more of these beautiful creatures, working hard.Simple because there is no other means of transport for the owner.They truely are wok horses.